The Rebel Sweetheart. : Foodie Goodie | Caesar Coleslaw. Taking a stab at healthy eating? Here's a salad recipe that's easy peasy to make. Prepare this dish the day before serving and refrigerate overnight so that the dressing soaks well into the vegetables. 1. In a large serving bowl, whisk together the mayonnaise, lemon juice, garlic, mustard, and pepper. 2. Add the cabbage, carrots, and scallions to the bowl and toss to coat. 3. Cover and refrigerate the salad overnight, or until ready to serve. 4. Top with croutons prior to serving. This sounds so good! I don't care much for coleslaw but my husband loves it. I do, however, love caesar salad so this is a great way for us to both get what we want. Thanks for sharing it! 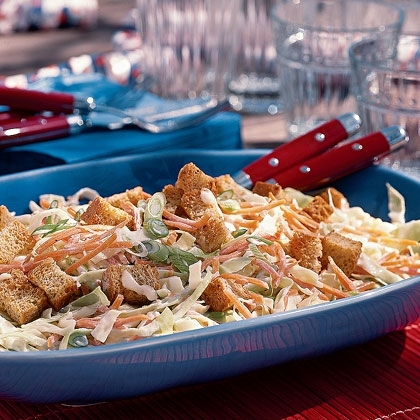 I don't normally like cole slaw, but this sounds tasty! sounds soooo easy!!! would love to give this a try. soon.